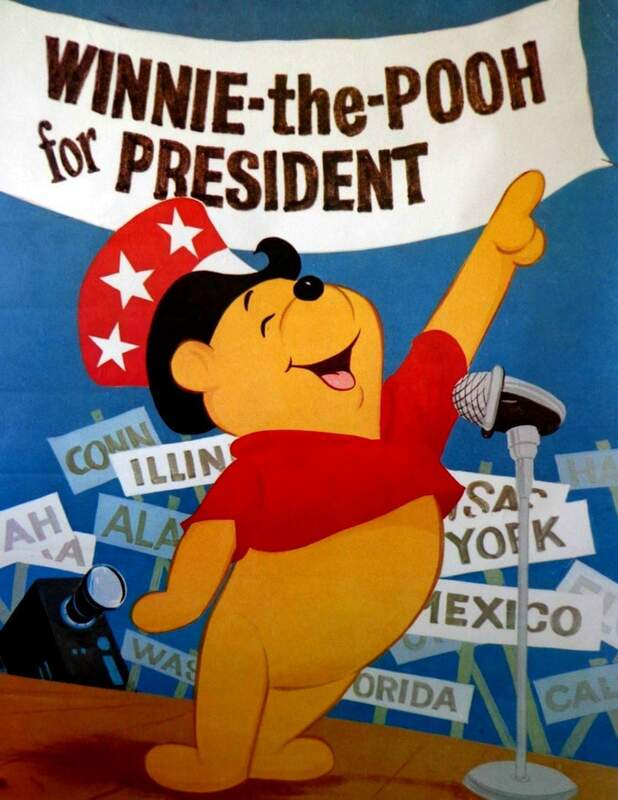 The date was March 19, 1963. 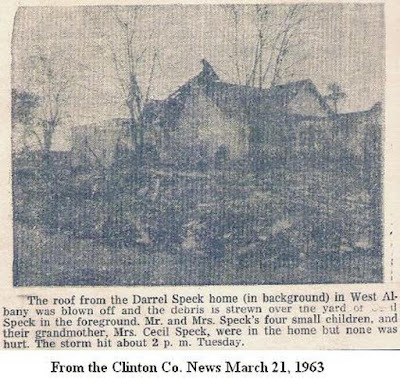 Two tornadoes struck minutes apart in Clinton County on this date. It was an unseasonably warm afternoon and it looked like it might rain. A dark cloud loomed on the horizon. Sure enough, along about two o'clock, a strong wind arose, accompanied by much hail and a torrential rainfall. Three-fourths of an inch of rain fell within five minutes. One tornado struck in the Static, Beaty Creek and Duvall Valley communities. The Maupin United Methodist Church building was knocked six feet off its foundation. The home of Mr. and Mrs. Jack Beard was damaged. She was knocked unconscious but was not badly injured. 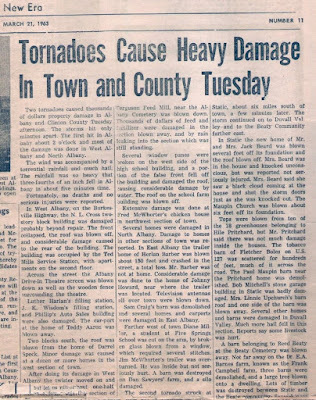 At almost the same time, a second tornado struck West Albany, ripping the front off Ted Mills' Service Station on the Burkesville Road. Across the street, it brought down the screen at Albany Drive-In Theater. Luther Harlan's Filling Station, Phillips Auto Sales and Wisdom Filling Station were also damaged, as was Ferguson Feed Mill near Albany Cemetery. 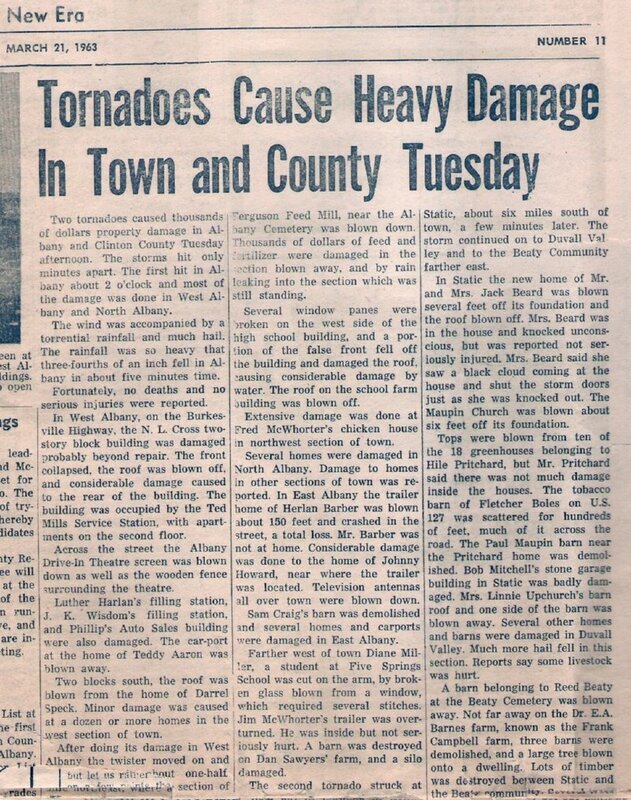 Several homes were reported damage, the worst occurring two blocks south of Ted Mills' Service Station at an upstairs apartment at the end of Hopkins Street. In that apartment, a grandmother had sought safety underneath the kitchen table. In one arm was her three-month-old grandson. In the other arm were his two brothers, ages 3 and 4, and a two-year-old sister. I was the three-year-old. There had been almost no advance notice. My grandmother would later say she looked out the window just in time to see a huge black cloud coming straight at us. The apartment we were in was above a garage behind her house. There wasn't enough time to run downstairs to the basement in her home. My grandmother realized that with her arms busy holding her grandchildren, she had no way of holding onto the kitchen table we were all under. She instructed my older brother and I to run to our parents' bedroom and get under the bed, but it was too much for a couple of scared 3 and 4-year-old boys to handle and we went running back to my grandmother. I can't imagine the thoughts of terror that ran through her mind when she saw us come running back. She only had time to put her arm around us when the tornado hit. Later, she would recall the haunting sound as hundreds of nails were ripped from the wood as the roof came off. I can recall the eerie calm after the storm, where everything seemed to be running in slow motion. Where the ceiling used to be, there was only the sky. As we began to crawl out from under the table, the front door to the apartment burst open and in walked a strange girl. 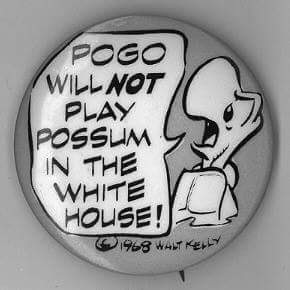 Her name, I would later discover, was Peggy Pickens. 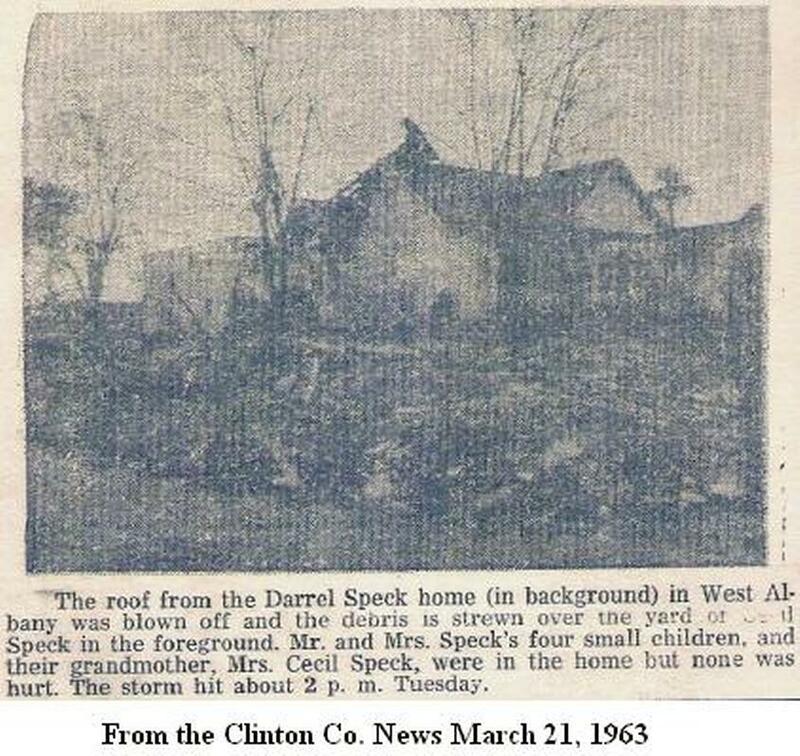 She and a friend had decided to skip school that day and were walking along Hopkins Street when the tornado struck and afterward, came running to the apartment. 22-year-old Weldon Gibson, whose family lived behind us, also ran to our home just seconds after the storm had passed. The stairway leading up to the apartment had been pulled loose from the side of the building, but that didn't stop Peggy and Weldon from climbing up the stairway to help us get out of that apartment. What brave heroes they were that day. While the anthems of most countries are either martial victory songs, or tend to communicate other laudatory or self-congratulatory sentiments, “The Star Spangled Banner” is unique in its message of endurance and perseverance. It commemorates the ability to withstand attack; enduring and continuing even when the odds are not in our favor. On March 3, 1931, President Herbert Hoover signed a law making “The Star Spangled Banner,” the National Anthem of the United States of America. And today, we celebrate March 3rd as “National Anthem Day” each year. My favorite country music singer, Don Williams, whose amazing voice powered such great country hits as "Lord, I Hope This Day Is Good" and "Till The Rivers All Run Dry," has announced his retirement, according to a news release from his publicist. In early February, the Gentle Giant, who is age 76, was forced to postpone his 2016 tour following unexpected hip replacement surgery. After seven years with the folk-pop group Pozo-Seco Singers, Don Williams began his solo career in 1971, singing popular ballads and amassing 17 number one country & western hits. His straightforward yet smooth bass-baritone voice, soft tones, and imposing build earned him the nickname: "Gentle Giant." 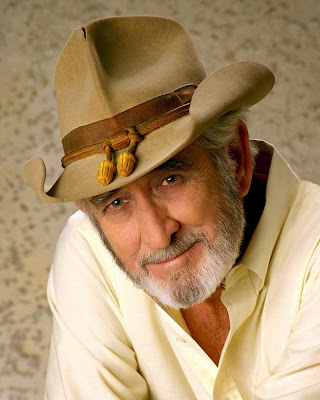 Don Williams was one of my dad's favorite singers, and mine too. At age 13, I would occasionally perform with dad at country clubs and private parties. We played cover tunes and Don Williams was always on the list. The song I remember playing most was 'We Should Be Together,' which is at the top of my all-time favorite songs list. I Believe In You, Lord I Hope This Day Is Good, I'm Just A Country Boy, You're My Best Friend, Tulsa Time, Some Broken Hearts Never Mend, Love Me Tonight, Till the Rivers All Run Dry, It Must Be Love, Amanda, We Should Be Together, I've Been Loved By The Best, Love Is On A Roll, If Hollywood Don't Need You, I Wouldn't Want to Live If You Didn't Love Me, Nobody But You and Desperately. Don Williams was inducted into the Country Music Hall of Fame in 2010.